"Delicious Taste" is Artillery Magazine's Pick of the Week! Technology is always suspect, even in its pleasurableness. We love to hate it, yet we rely on it arguably to the point of our own obliteration. 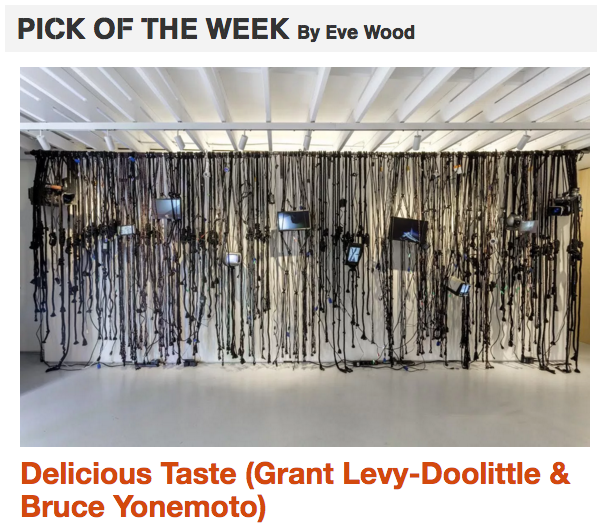 Bruce Yonemoto and Grant Levy-Doolittle have quite literally woven together the fibers that decimate information in our culture whereby computer screens, data signals, currents and all manner of codes converge into a strange amalgam of crosscurrents. Computer screens blink and flash, cell phones jingle and vibrate amid a wall of black ropes and fragments of hanging technological debris. It is a true Kubrickian nightmare, yet still so pleasing and seductive.